At the U.N., President Trump asked other nations to honor U.S. sovereignty, and in return the U.S. "will not tell you how to live or work or worship." But then he rejected Iran and Venezuela's right to do just that, while decrying multilateral institutions that try to investigate and prosecute corrupt leaders. Former U.S. Ambassador John Feeley is a Univision diplomatic analyst. He arrived late. He insulted and ignored traditional democratic allies. He provoked mocking laughter from the gathered leaders for claiming that “ in less than two years, my administration has accomplished more than almost any administration in the history of our country.” In this, Trump was just being Trump. Yet it must be observed that Donald Trump did something remarkable and out of character at the United Nations on Tuesday: he was consistent in his worldview. Even his closest friends and staff do not accuse Trump of being very intelligent, coherent or consistent, according to Bob Woodward's book Fear. Anyone who follows his Twitter account or daily press encounters has witnessed the dizzying speed with which the President reverses himself, and with great conviction, regardless of his position of the hour … which could change again before bedtime. However, during his speech at the United Nations, there was undeniably a consistency of thought and expression in keeping with his 2017 address to the General Assembly: in a word, his obsession with the concept of sovereignty. Metternich and Bismarck, the authors of modern realpolitik must have high-fived each other in the grave. The only problem was that much of the rest of Trump’s speech did not logically support this clarion principle of the veneration of sovereignty. To be clear, I heartily agree with the President’s statement regarding Venezuela and the needless suffering that a socialist regime has visited upon its own people. But didn’t the President just call for respecting what other sovereign nations do inside their own borders? In multiple examples spanning the globe, Trump offered critiques of regimes that torture, violate human rights, persecute religious minorities, confiscate democratic rights though illiberal and authoritarian governance …all within their own, wait for it … sovereign borders. Moreover, he called for action to stop it. Sounds like a world’s policeman, no? 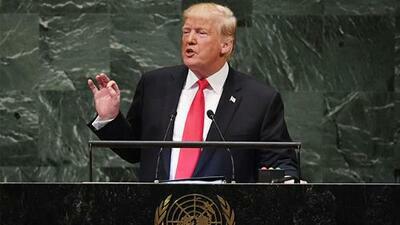 While decrying multilateral institutions such as the U.N. and the International Criminal Court (ICC) as sovereignty violators, Trump crowed about new and ongoing unilateral sanctions on Venezuela, Iran, and North Korea. And encouraged other nations to do the same. So while the defense of sovereignty was the speech’s dominating rhetorical leitmotif, the specific analyses and proposals the President offered contradicted his very guiding principle. For those waiting for Trump’s trademark, whiplash contradictions, there were a few gems. What the President and his advisors fail to grasp is that an international rules-based order is a voluntary set of codes, NOT global governance. The Obama Administration never signed up to the ICC because, as a world leader with men and women deployed in and out of uniform globally, we stand a much greater risk of non-sovereign prosecution than any other nation. Moreover, we have quite strong military and civilian prosecutorial capabilities here at home, as Trump is uncomfortably discovering. For a dictatorship like Venezuela, which within the confines of its sovereign state has all but obliterated free, fair and transparent court system, the ICC is all there is to investigate and prosecute the corrupt leaders who have sacked that once rich nation and starved its people. While the President and his national security team deserve a modicum of credit for enunciating a consistent worldview, one that recalls the famous “Ostrich Policy” of Mexico's PRI dynasty, with its head stuck in the ground so as not to see what other nations are doing, in the end Trump rather consistently followed previous U.S. leaders at the U.N. He told other nations what they should do, how they should do it. The radical difference from past practice was Trump’s preference for threats over collaboration and international diplomacy. And that makes the United States fundamentally weaker, not stronger.